Owning an ice cream parlor or ice cream specialty restaurant is a great way to escape the mundane and add something different and exciting to your community. During the summer months, ice cream parlors are extremely popular, and if you offer high quality ice cream creations to your customers, you are likely to have a lot of traffic, which translates into high profits for your business. Deciding exactly which ice cream types and flavors to serve to your customers becomes the most challenging decision you must face. There are countless different forms and flavors of this popular treat, and selecting the ice cream that will satisfy your customers, and keeps them coming back for more, can be quite daunting. Understanding the various types of ice creams: traditional flavors, unique combinations, healthy options, and current ice cream trends, will prepare you to create a menu that will stun your customers and improve your business. There are many different types of ice cream. Traditional scooped ice cream is made from cream, sugar, and eggs, and has a thick consistency and a very sweet flavor. Soft-serve ice cream is made from scratch or from a powdered mix to which milk is added. 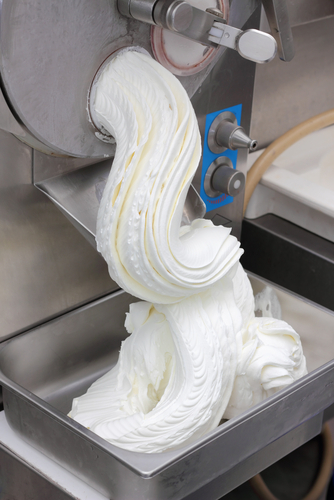 Soft-serve ice cream is generally placed in a machine with a constantly spinning rotor inside. This rotor keeps the ice cream soft and pourable, while still maintaining its frozen state. Frozen custard is a type of specialty ice cream that is made with a higher content of egg yolks. The additional egg gives frozen custard a much richer, fuller flavor and texture. Traditional ice cream flavors are vanilla, chocolate, and some fruit flavors. These flavors enjoy the most popularity in the ice cream world. Ice cream parlors that specialize in various toppings and mix-ins may be able to get by with just these traditional flavors. Parlors, however, that are designed to "wow" customers and create a sense of novelty, will need to feature an expanded flavor lineup. Combination ice cream flavors usually feature two or three different flavors in one combination. Mint Chocolate Chip, for example, is a popular flavor that combines the cool sweetness of milk with the rich flavor of chocolate. Fruit flavors, like strawberry and banana, are also combined frequently. Today, some ice cream parlor owners are making up their own completely unique flavor combinations by using unexpected ingredients such as chili powder, flower extracts, herbs, and even vegetables. Adventurous customers will enjoy sampling these bizarre flavor combinations as long as they are selected and paired well with other flavors. One great way to appeal to a larger crowd of customers is to feature several healthy ice cream concoctions on your ice cream menu. Frozen yogurt, for example, is often perceived as being healthier than traditional ice cream. You can also make ice cream with reduced fat milk and less added sugar, to cut back on the amount of fat in this popular dessert. Creativity is key when creating your ice cream shop menu, so don't be afraid to try new flavors and new methods when making the ice cream that you will sell to your customers.